Find better leads, close more deals, and grow your accounts on the world’s #1 CRM. 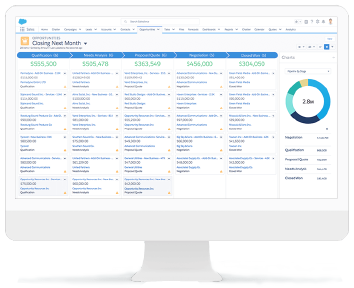 Sell faster and smarter with a flexible, AI-powered sales platform designed to maximize rep productivity and success. Sales Cloud enables you to create a world class sales experience with a 360 degree view of your customer from lead to cash. Turn more contacts into long-term customers with a deeper, more personal approach to sales. Help reps sell smarter with an AI-powered sales platform. 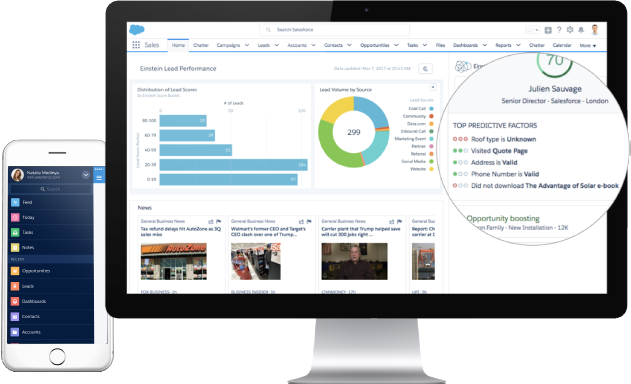 Salesforce Einstein lets you build artificial intelligence right into the sales process. Automatically capture data and get instant insights, such as top leads, next steps, and suggested actions. Accelerate productivity with a flexible user experience. Sell from the field. Sell from your inbox. Sell the way you want, lightning fast, with an easy tocustomize, AI-powered CRM system. Close more deals anytime, anywhere. See everything from sales forecasts to team performance on any device — a laptop, a phone, you name it. Focus reps on the most important actions, giving them the right advice at the right time. Explore the CRM software features that can help you grow sales faster. With Sales Cloud, you can grow your accounts faster, find new customers faster, and close deals faster – from anywhere.